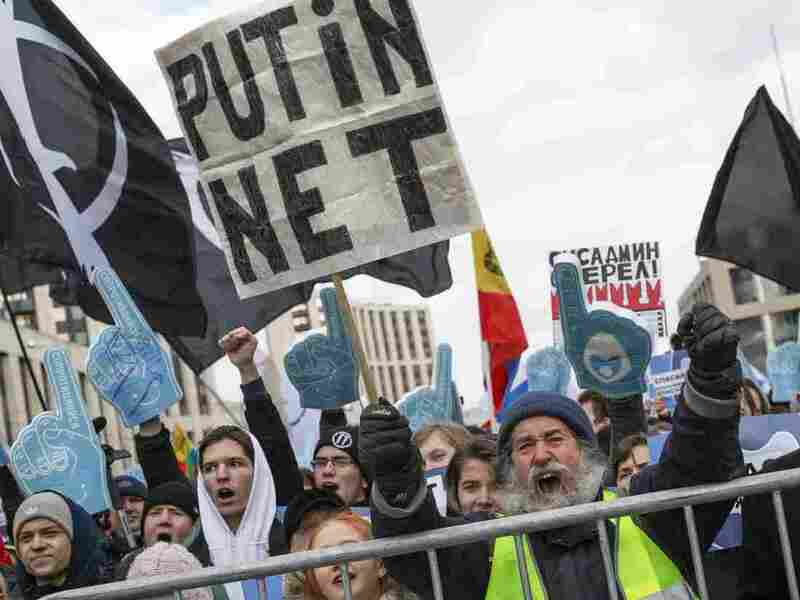 Protesters Decry Internet Isolation Bill Expected To Pass In Russia The rallies follow a bill to cut Russia off from the global Internet. Demonstrators on Sunday chanted, "Hands off the Internet." About two dozen people were arrested. Demonstrators shout during a Free Internet rally in Moscow, Russia, on Sunday. The protesters fear widespread censorship and isolation, following a bill that calls for Russia to be cut off from the global Internet. Media outlets have described the protests in the capital as "some of the biggest" in years. At the heart of protesters' objections was the sovereign Internet bill, which has been wending its way through the Russian Parliament. The measure would require data between users to be rerouted internally, as opposed to being sent to servers abroad. Lawmakers have argued that the legislation is necessary to protect the country from foreign aggression. Critics disagree. "The government is battling freedom, including freedom on the internet, I can tell you this as somebody who spent a month in jail for a tweet," activist Sergei Boiko told a crowd in Moscow, according to Agence France-Presse. Police made about two dozen arrests and seized balloons they determined to be "unmanned flying vehicles," NPR's Lucian Kim reports. The Libertarian Party called for the protest in central Moscow. Rallies were also held in St. Petersburg, Voronezh and Khabarovsk, Reuters reported. Protesters chanted "Hands off the Internet" and "No to isolation." Lawmakers are expected to deliberate on the bill later in March. Eventually, the legislation will need to be signed into law by President Vladimir Putin. It "will surely be approved," Russian journalist Andrei Soldatov tells NPR. He expects there will only be minor changes to the measure in parliament. "The main thing – to give the government the option to isolate a particular region or the country in time of a crisis, is to be preserved, for sure." He adds that two industry giants, Yandex and Mail.ru, support the proposal. "It's the first legislation which has its costs placed on the government, not the companies," he says. 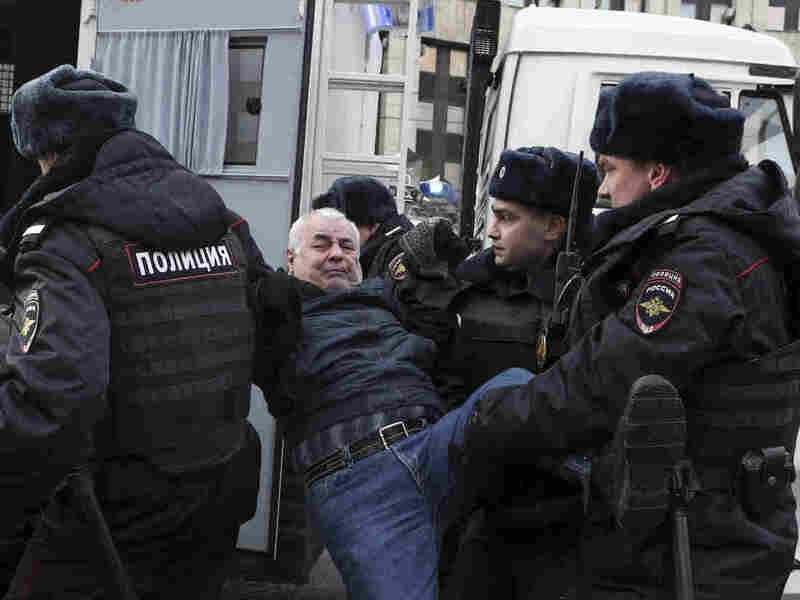 Police officers detain a demonstrator in Moscow on Sunday. The rallies follow other controversial bills that Russia's parliament recently passed. The legislation allows courts to fine citizens up to $3,000 or jail them for 15 days for showing "disrespect" online to government officials. Authorities could also force websites to remove content deemed as fake news. The Internet tightening tactics are seen by some as a way to control public discourse, especially as Putin's approval rating has fallen more than 20 percent from 2014 to 2019, according to the Levada Center polling. Last year, communications oversight agency Roskomnadzor "waged a battle" against messaging app Telegram, Human Rights Watch said. The company refused to comply with an order to provide encryption keys which would enable authorities to read users' messaging data. When the government tried to ban Telegram, Russians took to the streets. As part of their protest, they threw paper planes, the symbol for Telegram. The company evaded the government's block by domain fronting, concealing the traffic's true source with a domain that isn't restricted.